These rules will be updated on October 16th, 2017 at the opening of the contest to include other methods of entry. By entering the following forum you agree to the following: Entry will be between 12:00pm (ET) on 10/16/17 and 11:59pm (ET) on the final day of contesting which will be determined soon by entering either online at wecw.elmira.edu. General information for station use, communication, and personal verification will be collected. Your information will remain secure with 107-7 executive staff only. If you are chosen as the winner, you will be contacted via email the day after the contesting concludes. No purchase necessary for contest entry. One entry per person. Participants must not be employed by any radio station the Nielsen defined Elmira-Corning radio market, excluding general members on 107-7. Executive board members and board members of 107-7 are not permitted to enter the contest. 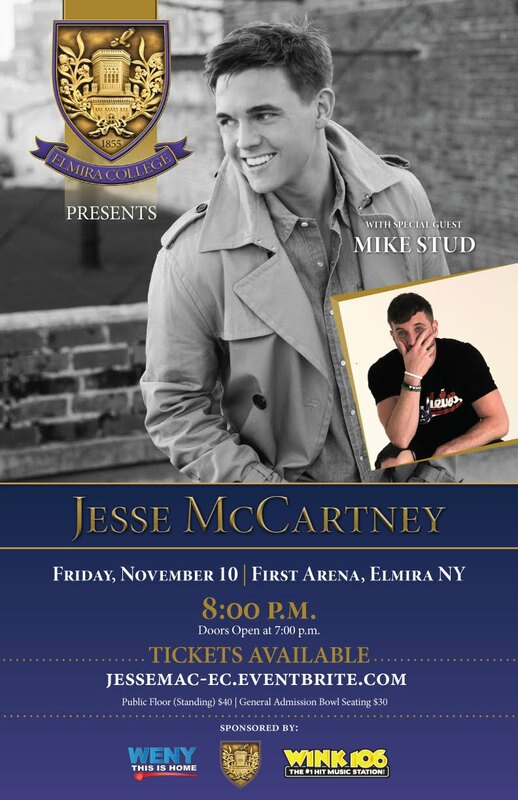 Participants do not need to be an Elmira College student to win the tickets, this contest is open to all in the listening area be it online or over the air. Tickets will be mailed to the winner when correspondence is received from the winner saying it is ok to do so. Transportation is not provided, only the pair of tickets are part of the prize. WECW 107-7, and Elmira College are not responsible for any damage, injury, or any incidents that occur as a result of winning. Please forward questions to General Manager, Mike Kerr at mkerr18@elmira.edu.